This four-year, cross-sectional study, situated in one U.S. university, investigated 206 preservice teachers’ use of social network services (SNS) in teacher preparation and their disposition toward using it in their future teaching. Using descriptive survey methodology, results revealed nearly all preservice teachers used a general SNS (e.g., Facebook), but about 40% never read blogs, wrote blogs, or read wikis; about 90% never wrote wiki, and about 80% never read/wrote Twitter. SNS users consumed (e.g., read) more content than shared or generated (e.g., posted, wrote). Use of SNS for professional activities rose from 7 to 22%. Trends indicated general SNS (e.g., Facebook) and Twitter use was mostly personal, while reading blogs, wikis, and writing blogs was equally personal and educational, and writing wiki was mostly educational. The majority of these preservice teachers put ‘a lot’ of restrictions on their SNS accounts. The likelihood that preservice teachers felt they would use social networking in their future teaching became less likely. 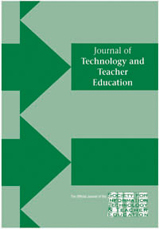 Discussion examines (a) how teacher education programs prepare new teachers as learners and designers of new technologies and (b) describes a sequence of SNS experiences that develop preservice teachers as learners, designers, and ultimately connected educators. Hughes, J.E., Ko, Y., Lim, M. & Liu, S. (2015). Preservice Teachers’ Social Networking Use, Concerns, and Educational Possibilities: Trends from 2008-2012. Journal of Technology and Teacher Education, 23 (2), 185-212. Waynesville, NC USA: Society for Information Technology & Teacher Education. Retrieved April 23, 2019 from https://www.learntechlib.org/primary/p/130448/. Carter, K. (1990). Teachers’ knowledge and learning to teach. In W.R. Houston, M. Huberman & J. Sikula (Eds. ), Handbook of research on teacher education (pp. 291-310). New York: MacMillan. Madge, C., Meek, J., Wellens, J., & Hooley, T. (2009). Facebook, social integration and informal learning at university: ‘it is more for socialising and talking to friends about work than for actually doing work.’ Learning, Media and Technology, 34(2), 141–155. Doi:10.1080/17439880902923606Mallia,G.(Ed.). (2013).Thesocial classroom: Integrating social network use in education. Hershey, Pa: igi global. Reich, J., Levinson, M., & Johnston, W. (2011). Using online social networks to foster preservice teachers’ membership in a networked community of praxis. Contemporary Issues in Technology and Teacher Education, 11(4), 382-397. Wong, T. (2013). Meeting needs: are you connected? School Library Monthly, 29(8), 33-34. Wopereis, I.G.J.H., sloep, P.B., & Poortman, S.H. (2010). Weblogs as instruments for reflection on action in teacher education. Interactive Learning Environments, 18(3), 245-261.